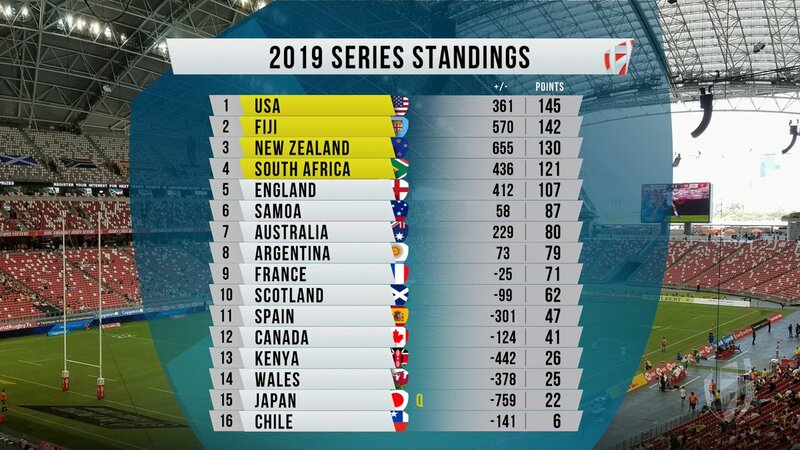 After the eighth round of the Word 7s Series held in Singapore 7s, USA have maintained the top spot on standings. Mike Friday charges who collected 15 points from Singapore 7s have now hit 145 points from the eight rounds. Fiji have 142 points thanks to three main cup wins in the last eight rounds. They are just three points behind leaders USA. New Zealand have maintained the third spot with 130 points in the eight outings. Singapore 7s champions South Africa close the top four slots with 130 points. The top four sides will earn a direct ticket to the Olympic games set for Tokyo Japan. England have 107 points with their best finish being at Singapore, Dubai, Sydney where they collected 17 points each. Samoa, Australia and Argentina sit at position six, seven and eight respectively. France and Scotland close the top 10 list. Spain are placed 11 on the log followed by Canada. Kenya 7s picked three points in Singapore they have moved to 26 points. Shujaa remain 13th on the log while Wales just a point behind Kenya.